Jaime Keithline of Crabgrass Puppetry Theatre was just one of the events during Arts Week. Many schools offer special arts programs, typically forty-five-minute events that have an educational focus with, perhaps, a connection to the curriculum. But Clara Macy Elementary School in Bellingham has a long-standing tradition of celebrating the arts for an entire week near the end of the school year. 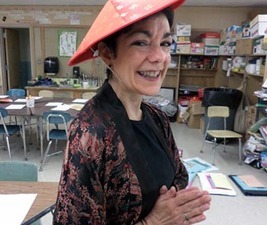 “Arts Week” at Macy originated with former Principal Annette Packard, who was passionate about the arts herself and encouraged her staff to fully embrace the role of arts in education. A lot of the artistic expression the students and faculty experience during Arts Week at Macy is homegrown. The Macy Grade 4 chorus performed for the entire school, and the BMMS Band provided a concert. The ever-popular talent show rounded out the week’s events. The school also enjoyed the skills of Li Lui, who demonstrated amazing Chinese acrobatics that kept the children spellbound. The Crabgrass Puppetry Theatre shared “Fantastic Folk Tales from around the World,” and, after the performance, pulled back the curtain to explain (some) of the secrets of what made the puppets work. Puppeteer Jaimie Keithline described how the different types of puppets were constructed and how the scenery was created, and showed the children some of the tricks he uses to animate the puppets. During the performance Keithline clearly delighted in his work, building suspense and drawing the children into each tale he shared. At the end of the program he explained that while he wasn’t able to travel to Gabon, Greece, and India, the three countries in which his folk tales originated, he could go to the library to learn about them. Another school year has come to a close, as has another celebration of Arts Week at Clara Macy Elementary School. The tradition continues. There may well come a day when Macy is no more, but the lessons learned and the shared experiences of Arts Week are not soon to be forgotten.